Sleeping "Bella-B", after a long day without the tube! sportin the R,W,&B ribbons for the 4th! And that it is…. The fireworks will be in Miss Bella’s honor tonight! For the past couple of days the docs have been doing whats called “Sprinting” with Mia. The Respirtory Therapist comes in and adjusts the machine to a setting where Mia and her lungs have to do all of the work. They let her breath on her own for about an hour and then the machine is turned back to support for few hours. This lets Mia exercise her lungs while having back-up support if needed. She didn’t suffer through the exercise program like most of us do at the gym, she didn’t even break a sweat. Well, this morning during rounds, the docs concurred that it was time for Mia’s endotracheal tube (most definitely not her BF) to be removed. So… as you all know, the most recent post was published during the wee hours of this morning. That’s what happens when Tom decides to stay up here at night. He is cut off for the rest of the week because Krista said he has to focus at work. And…. he just took off for the Real Soccer Game (thanks JK for the tickets) with his new P.I.C.U BFF Jameson, the father of 14 yr old little girl up here. Fancy that…. Tom meeting new friends. Luv it. I really wanted you all to share in the happiness of the day before it comes to an end and I knew Tom would not get the chance. So I write. Tom rolled in at 7:30ish this morning and went straight to bed. I stayed home with Eli last night and before I left, I knew about the scheduled “sprint” for 4am. When I woke and saw the van in the driveway and Tom asleep in Eli’s bunk downstairs, I decided to give room 10 a call to see how Mia’s night had gone. Nicole, our nurse (and one of our fav’s) told me she had a great night and they were going to take the breathing tube out this morning. I also have to tell you that Nicole calls herself Mia’s “good luck charm nurse”. 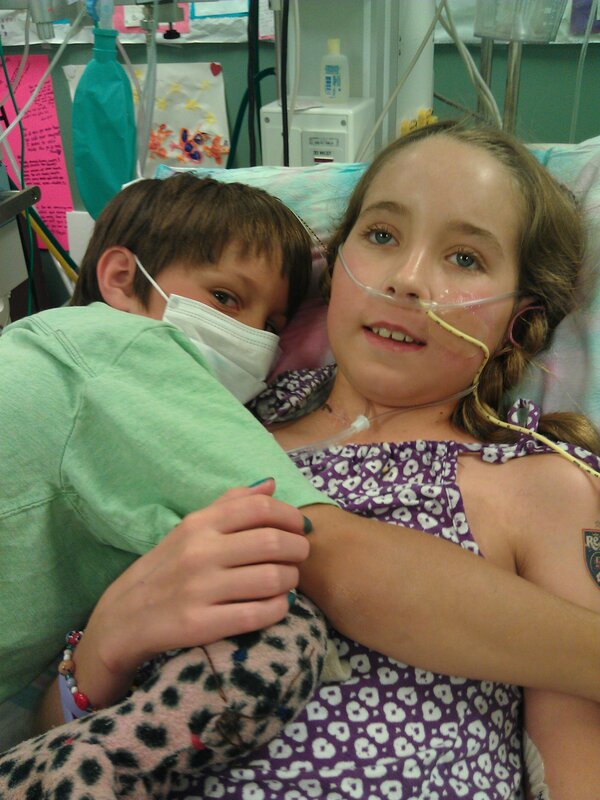 She was there caring for Mia the day we were told Mia was going to receive the gift of “life” and now here she is again caring for Mia the day she was given the gift of taking her own breath. Dr Frank asked Mia is she wanted to wait for her parents to take the tube out or suprise them. She wanted to wait. I called around 8:30am, Mia had gone back to sleep and I told Nicole I would let Tom sleep a bit longer and we would be up. Mia changed her mind!!! It was 10:30am when she woke up, she remembered the earlier discussion with Dr Frank and decided she wanted it out NOW….. not caring if we were there or not (I don’t blame her). Tom, Eli and I arrived just after they pulled the tube at 11am, we were welcomed with the biggest smile and a simple whisper “hi.” Her throat is sore and vocal cords will need some time to recover. While Tom and I snapped away with the camera’s, Eli had tears in his eyes, jumped into her bed and gave her a big fat “little brother” hug and kiss. All of us in the room 10, Docs and nurse Nicole cried. Mia spent the day sitting in her rocking chair, looking at her email and looking for songs on her new itunes account that Quinn and Jesse set up for her birthday. Her Uncle David and Aunt Stacie brought up some new nail polish (pink, orange and light green… cute!!) Mia was able to whisper to us “pink on my fingers and green on my toes”. It’s a beautiful day here people…. and I am so blessed to be able to share it with all of you, our circle we call our friends and family. Perspective….. such a gracious mentor and guide. heidi, while i’ve become accustomed to hearing from tom and relish his updates, it’s wonderful to hear your voice! of course, nothing at all like your hearing your daughter’s voice! great news and lots of love and good vibes from sugar house, from all of us. we think about all of you daily. Wow- Miss MiaBella ! What an incredible day for you- Freedom Day ! I am so happy for you and your crazy pop, lovely mom and darling Eli ! And did I say so happy for you?! I cannot wait to see you ! I couldn’t go to bed without checking on you, and I’m sooo glad I did. I had to do a double-take at that beautiful photo of you. First I noticed the cute braids and ribbons and wondered who your talented hairdresser was :), but then wait . . . . all you had was a little oxygen tube! Mia, that is so awesome. I can’t wait to show Genevieve! You must have so much to say. Thank you for fighting so hard, Mia. We’ll never know what you’ve been through, but I’m so happy that you can now start to express some of your feelings. We cannot wait to see you, Mia. And we are absolutely NOT officially starting the summer until we do. Lots and lots and lots of love, Mia. Beautiful! We think of you everyday, and are so happy that you are recovering. Keep up the hard work. We are cheering for you! Mazel Tov!!! We’ve been keeping our fingers crossed for this wonderful day. Our thoughts are with all of you. WOOHOOOOO!!!! I am so happy and thankful to read of all the new developments going on with strong, beautiful Mia!!! Way to go, Mia! You are a living and breathing miracle. You will never know how much you have inspired so many of us out here! Which brings me to my next point of gratitude: Thank you so much, Tom (and sometimes Heidi too!) for these beautifully written, heartfelt posts that allow all of us to glimpse the love and miracles and tenderness going on in Room 10. I love reading them so much, and my eyes fill with tears and my heart swells every time. It truly is “All About the Love”.You are awesome examples of that. Each one of you! I hope today is a good day, that the throat and vocal chords feel better soon, and that you can feel the love from the McQ’s. Mia, Mia. 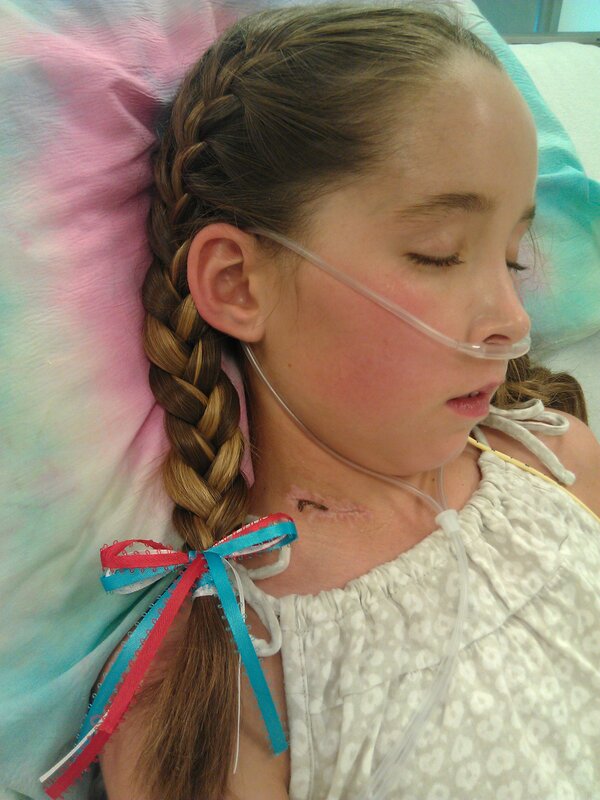 You are so beautiful… sleeping in this picture, with NO TUBE! I wish I could write all the words to explain how beautifully you have effected my life and my life with my kids. Every time I read a post, I cry. And my kids hover around my pgone or computer as I read out loud. I ALWAYS cry. And lately, they are tears of great joy. And while they are asking, “are you okay mom” I hug and squeeze them and tell them that I am so blessed to have them in my arms. Your sweet and loving relationship with Eli has changed their relationships with each other. I bet it feels SO GOOD to talk! To pick your own polish color, to surprise your family and say HI! I am so happy for you, Mia. You are strong and a true hero. I wish you a wonderful day and the rest you need to be able to say all you need to today… and you may even be able to tell your dad to stop singing! Thank you so much for sharing these great news with us, Heidi!! Happy 1st aniversary day, Mia!! Have a great one and please continue taking (baby) steps up the hill!! @Eli: you rock! you are a wonderful brother! oh man! this is great news! she will be so much more comfortable and you guys will finally be able to communicate so much better. eli is such an awesome brother…if they weren’t already close, this time in their lives will seal the deal. you’ve come a long way, Mia!!! Go Heidi! For writing! Yay!!!!! Mia, I can’t stop staring at your beautiful picture without that tube. Yesterday was indeed a day for celebration! YOU GO GIRL!! Yea!!!! What wonderful news! We are so happy for all of you. Hugs all around! What an incredible step forward. We are all so happy for this news. We continue to wish you all positive & bigger steps in this direction and can’t wait to see you all run out of the hospital. Keeping you all in our thoughts daily! Congratulations Mia!!! Independence day will always have new meaning for me:) We are so excited for you…now you can get on that beautiful computer of yours and begin to talk with all your friends who have been waiting to hear your voice again. Love, light and happy days to you! Heidi, Dr. B and Eli…thank you so much for sharing your journey with us. We are so happy for you..this is an enormous step for your beautiful, amazing Mia. May you have many joyous days to come! What amazing news!!!! We are so happy for all of you!! !